This was the first of two August HKT48 handshake events in Tokyo. The second one is coming up in two weeks. I decided to go light on tickets for this single, initially picking up only seven tickets for this event only. There was a chance I would be going to America in August, so I avoided the second event. However, after my trip got cancelled I picked up a few tickets for the late-August event on the final resale. Also, I always try to be strategic with my ticket scheduling in order to 1) avoid an unnecessarily long day, and 2) not overload any particular slot. 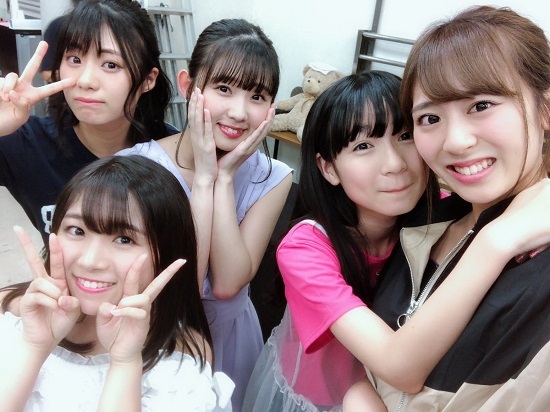 As it turned out, pretty much all the members I like were scheduled in the later portion of the day with the exception of Bibian, who was only scheduled for the morning. As a result, I ended up not getting any Bibian tickets for this entire release. It’s too bad, since I have really been ‘clicking’ with Bibian lately, and want to hang out with her. Anyway, I arrived at Ryutsu Center in the early afternoon since my first ticket wasn’t until the 2pm “Lunch” Slot. After grabbing an Oolong Tea from the conbini outside, I headed into the venue. The last time HKT48 was at this venue for their shamekai event they were in an extremely cramped building, which was also very hot. This time they were on the 2nd floor of the main building, which was much bigger, and much cooler. After going through security, I passed the stage where random members do special programs, and whaddya know… I immediately spot Yukachan in a blue Yukata. I grabbed a spot in the back of the standing area where I had a good view of her. With her on stage were Natsumikan, Aramaki, Emiri, Iwahana Shino, and Yamauchi Yuuna. I arrived in the middle, it seemed as if they were doing some sort guessing game with strange objects. I was really only seeing if I could grab Yukachan’s attention, as she was often looking over the audience. I think I caught her eye, but I wasn’t sure. 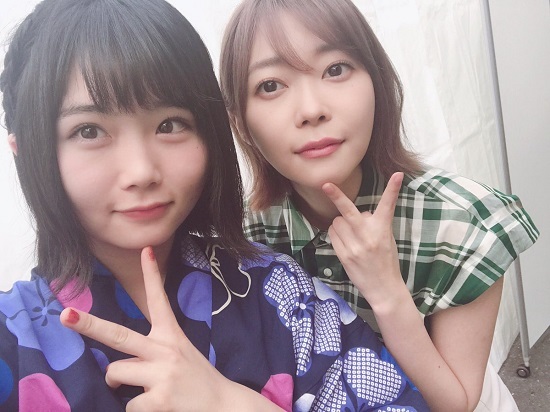 They also give fans the opportunity to purchase a CD and do a quick handshake with the members at the end, but I had plenty of Yukachan tickets, so I instead decided to head off for my first handshake. 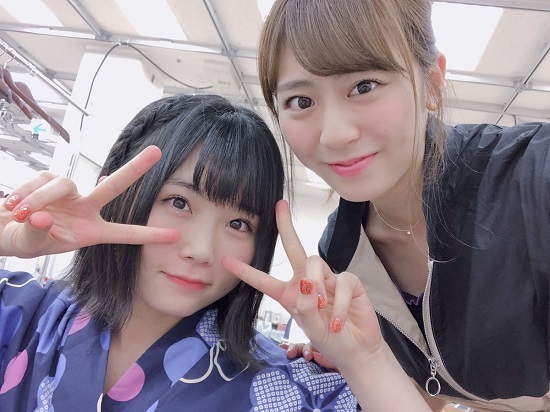 Yukachan was busy taking selfies with everyone today! By the way, it was about this time I’m pretty sure I saw @Tuhis walking through the hall, but I was heading to my next ticket so I didn’t stop. I looked for him later, and saw him queued in Madoka’s lane. Fuchigami Mai (Lane 15) I headed over to Maichan’s lane, but they hadn’t opened the gate yet. I ended up being second in line, which was good since I planned on quickly using my two Slot 5 tickets, and then leaving the venue for a little while. In the meantime, I watched a few of the members walk by heading to the far outside lanes, including the 3rd gen draftees who were going to the Special Stage. A few minutes later this really cute member who I didn’t recognize walked by wearing white shorts, green top, and a really pretty smile. It turned out to be Seki Ai, who is another new draftee. I think I will need to put her on my “need to meet” list for a future event. I was struggling to think of what to talk to Maichan about, but then I noticed the single poster tacked on the wall in the booth. Maichan entered the booth, looking adorable as usual. When it was my turn, I told her that I really like the new single MV, and whenever I watch it I am always looking for her scenes. This is actually true. She thanked me, and said she was glad I liked the video. Tomonaga Mio (Lane 9) I have gotten quite a few Mio tickets lately, although I ended up doing oshi-mashi with a couple of them. Initially I had a couple of fun handshakes with her, but lately I have contemplated not getting tickets for her in the future since I don’t know that I really ‘click’ with her. At the beginning of the slot she had a bit of a pre-queue, but that had died down by the time I came over. In fact, I pretty much went directly into the booth. 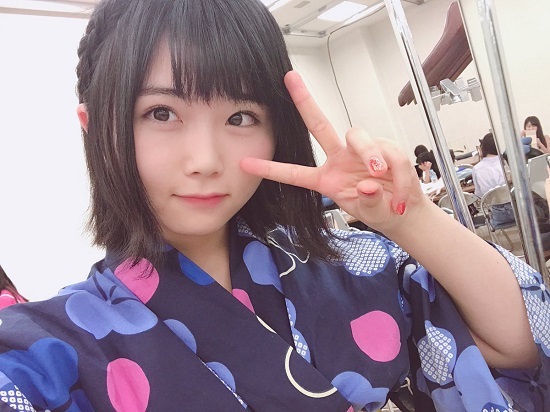 Akiyoshi Yuka (2nd ticket) So yeah, I pretty much related to her that I watched Rikopi’s stage, and quickly told her what they were up to. Yukachan smiled and said omoshiroi before I got kicked out. I had one more ticket for her in the final slot. This was one of the special stages where you actually needed a ticket to get in. The other was for Sakura, but that one had been cancelled since she was out for the day. Like with most ticketed special stages, they draw your ticket when you check in. There were 500 spaces, so you could get a very good number, or not so great. When I went through check-in I noticed my friend Koba, who is a huge Sasshi fan, was in the 450-475 queue. Damn, I’m sure he wasn’t happy about that! He directed me to the queues on the left since he thought most of the people with lower numbers were coming from those lines. I surveyed the scene for a minute, and noticed it was pretty random. Still, I took his advice and went to the far left queue. When it was my turn I could see into the staff member’s cup, and noticed that the ticket on top was #19. Oh please pick that one for me! Unfortunately she shuffled them around before picking, and I got #179. Hmmm, not great, but not horrible. However, I’m really not a big Sasshi fan, I just wanted to see the stage. So I ended up swapping my ticket with Koba so he could be closer to his oshi. My new entry ticket was #464. It didn’t make that big a difference. When I entered the stage area there was plenty of room right down the middle. In fact I was only 6-8 feet behind Koba. I had a perfect view of the stage, with relatively shorter people in front of me. I was good to go. The special stage was only fifteen minutes long or so. Sasshi came out and read a bunch of random questions that her fans filled out in her handshake lane. A lot of it was goofy stuff. One person did ask if she was going to graduate soon, but for the most part she just shrugged off the questions and gave snarky responses. Pretty much what you would expect from Sasshi. For the rest of the event she was doing Karaoke by request. A lot of people were shouting HKT songs, but she kept saying she wanted to do non-48 stuff. She sang parts of 3-4 songs, often changing the song tempo when she noticed the songs were going out of her singing range. Sasshi isn’t among the best singers in the group, and gets quite pitchy at times, but it was mostly just for fun anyway. And that was it. We were handed a special “ticket” for the event as we left. I was done with my tickets, and there was still 15 minutes left before the gates closed on the lanes. Damn! I could’ve purchased more Akiyoshi tickets. the only reason I didn’t was because I wasn’t sure about this special stage. Oh well, for the next HKT event I only have Akiyoshi tickets. Nobody else. So she will be getting my undivided attention.